Today we have a delicious soup recipe for you. 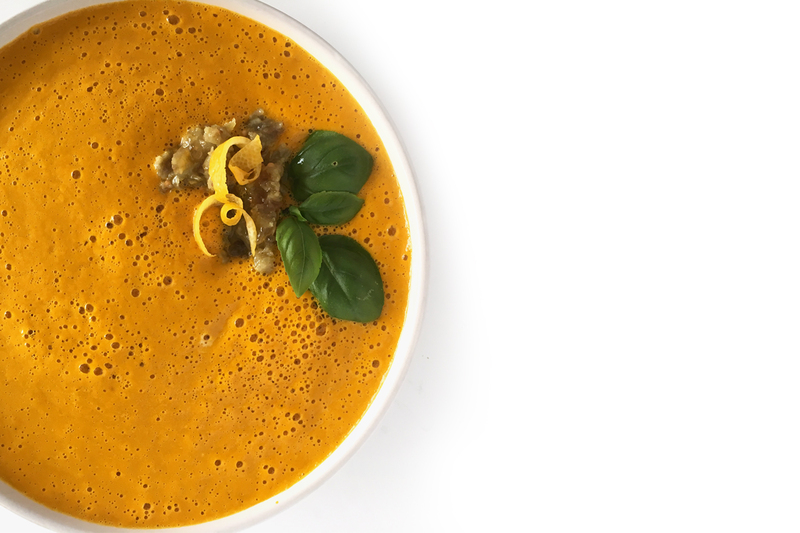 This Carrot Ginger Soup is quite simple to make and it’s loaded with life-giving nutrition. This soup is raw vegan so no cooking is necessary – just a quick mix in the blender and you’re good to go! No dishes, no scrubbing, no big mess! Both the soup and the relish are easy and quick to make (you can whip up both in under 30 mins). For many years I was a bit turned off by the “idea” of raw soup recipes. Somehow, they just didn’t look that appealing. However, after experimenting with a few different recipes I got excited about the fact that raw soups could, in fact, be savoury, creamy and so delicious. Personally, I love thick, blended soups, but I think it’s really important to give them a touch of texture for garnish (such as nuts, seeds, sprouts, or what have you on hand). For that reason, I suggest that you don’t skimp on the curried raisin relish. It adds so much character to the dish! In this recipe, you will be using fresh carrot juice as the base instead of vegetable stock. Store-bought vegetable stocks are mostly packed with an unnecessary preservative such as MSG, “natural flavourings,” and who knows what else! If you are into juicing try to experiment with creating your own combination for the base of nutrient-rich raw soups by blending your favourite juices with other ingredients – such as nut mylks, avocado, citrus, herbs, sea salt, and spices. Beets, celery, carrots, bell pepper, fennel, and even orange, ginger, and fresh turmeric all make great juicing ingredients for a raw soup base. 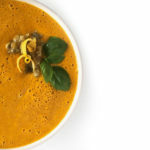 This soup is vegan, gluten-free and suitable for those following a plant-based as well as raw vegan diet and of course anyone who just want to eat more healthily. The combination of carrots and ginger creates a comforting combination in this satisfying soup - just the right treat during a cool fall season. Wash raisins well under running water. Place all ingredients in a food processor and pulse until well combined but still chunky. Store in the refrigerator. A 1/4 cup will be used as a garnish on the Carrot Ginger soup. Place all soup ingredients in a blender and blend on the highest setting until completely smooth. To serve, pour the soup into bowls. Add a few spoonfuls of the set-aside raisin relish on top of the soup. Serve warm, straight from the blender. Store leftover soup covered in the refrigerator for a few days, although it's best fresh or eaten within the first 24 hours. This soup is absolutely delicious on its own, but it would also pair well with things like our Multi-Seed Crackers or Basic Green Salad.